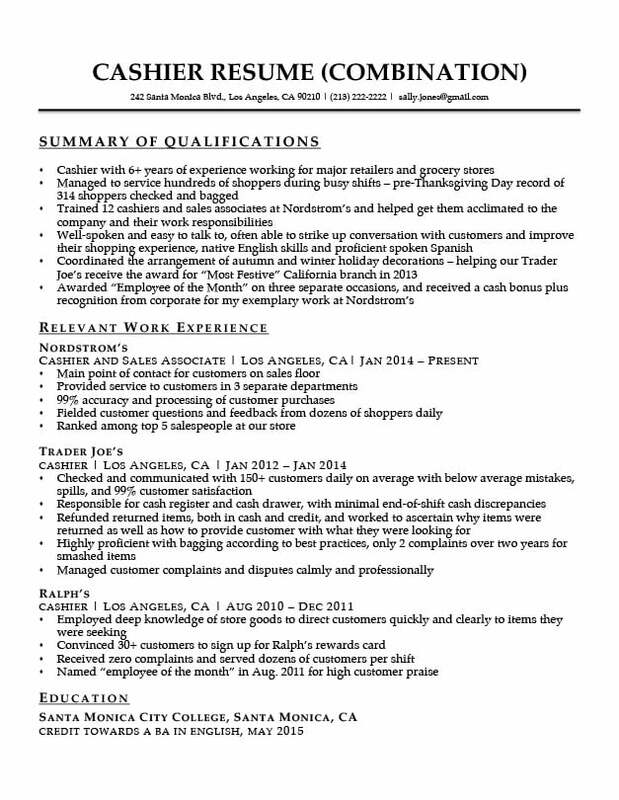 Not sure how to write a cashier resume? This resume sample can give you the guidance you need to successfully write your own. Be sure to carefully read our cashier resume writing tips at the bottom of the page, too. Or, if you’re strapped for time, be sure to try out our free, easy-to-use resume builder to create a resume in minutes. Below are two examples of a cashier resume; one with a career objective, and one with a summary of qualifications. Check out our qualifications summary guide to figure out which one suits you best. There are other ways to compose a resume for a cashier – if you want to know more about different resume formats, read about them here. 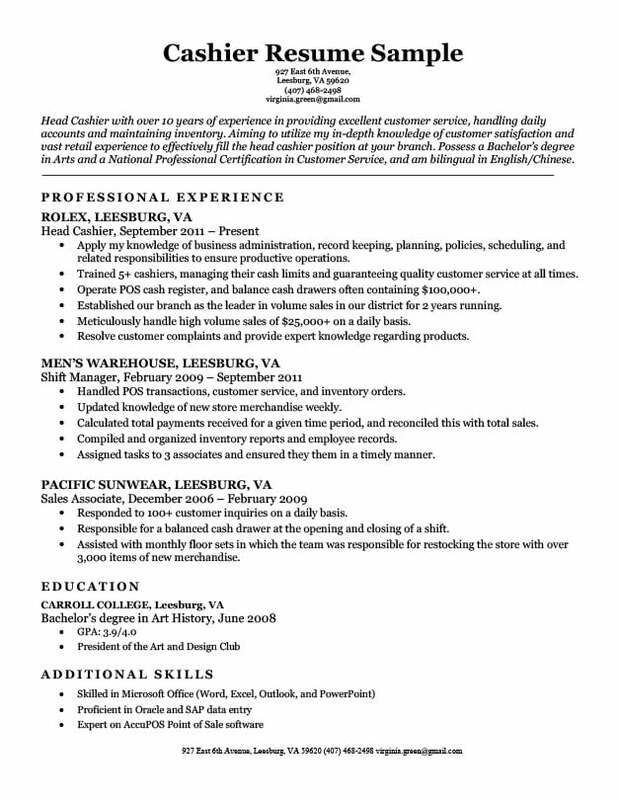 Also, check out our cashier cover letter sample and related resumes below. If you need additional help, take a look at our expansive cover letter collection for more tips and tricks to nab that next job. Head Cashier with over 10 years of experience in providing excellent customer service, handling daily accounts and maintaining inventory. Aiming to utilize my in-depth knowledge of customer satisfaction and vast retail experience to effectively fill the head cashier position at your branch. Possess a Bachelor’s degree in Arts and a National Professional Certification in Customer Service, and am bilingual in English/Chinese. Apply my knowledge of business administration, record keeping, planning, policies, scheduling, and related responsibilities to ensure productive operations. Trained 5+ cashiers, managing their cash limits and guaranteeing quality customer service at all times. Operate POS cash register, and balance cash drawers often containing $100,000+. Established our branch as the leader in volume sales in our district for 2 years running. Meticulously handle high volume sales of $25,000+ on a daily basis. Resolve customer complaints and provide expert knowledge regarding products. Handled POS transactions, customer service, and inventory orders. Updated knowledge of new store merchandise weekly. Calculated total payments received for a given time period, and reconciled this with total sales. Compiled and organized inventory reports and employee records. Assigned tasks to 3 associates and ensured they them in a timely manner. Responded to 100+ customer inquiries on a daily basis. Responsible for a balanced cash drawer at the opening and closing of a shift. Assisted with monthly floor sets in which the team was responsible for restocking the store with over 3,000 items of new merchandise. When applying for a cashier position, it is vital to remember that you are not just applying to work a cash register. The cashier position encompasses many different responsibilities including but not limited to customer service, merchandising, product knowledge, basic accounting, and even training. That is why it is important to not just emphasize your cash register abilities, but your comprehensive knowledge of retail as well. If you follow the above resume sample, you are sure to get the attention of hiring managers. It is important to not just emphasize your cash register abilities, but your comprehensive knowledge of retail as well. A quick DISCLAIMER: The above sample is from a candidate who has set their sights on making retail their career. It’s ok if your credentials don’t exactly match up with theirs because there are still ways to make your resume turn heads. These are all extremely relevant skills in the retail industry. Next, the applicant continues by describing what qualities they will use to help the company. The applicant sheds light on their “in-depth knowledge of customer satisfaction and vast retail experience.” Once again, the applicant uses provable qualities that will make the hiring manager’s mouth begin to water. Finally, the applicant states their educational degree. When it comes to the retail industry, it’s acceptable not to have a retail degree. Many of the skills necessary to be an outstanding retail employee can be learned through experience on the job. Just having a degree helps to demonstrate your work ethic. However, the applicant does state that they have a National Professional Certification in Customer Service and are bilingual in English and Chinese. This is the cherry to top off your cashier career objective. As mentioned before, an effective cashier must be a master of customer service and this applicant demonstrates just that with their certification. In addition, being bilingual is becoming increasingly sought after in the retail industry. While many hiring managers prefer Spanish, Chinese has also become a useful language to know as Chinese tourists are becoming regulars at department stores and shopping malls. The best way to demonstrate and prove your skills to a hiring manager is by quantifying it with measurable stats. The sample above is chalked full of them. Let’s take a look. – Meticulously handle high volume sales of $25,000+ on a daily basis. How much money do you handle in your cash register on a daily basis? What are your average sales figures? How many transactions do you complete during a normal shift? How many customers do you deal with on a daily basis? Although a cashier position isn’t a sales job, it is related and many of the skills of both positions are highly transferable. Mention ‘salesmanship’ on your resume to ensure you get the interview. These are important questions to ask yourself when coming up with strategies to quantify your resume. As you can see in the above sample, the applicant made good use of the sales figures in their resume. If you were a hiring manager, which would you prefer? Not sure which resume format to choose? Read our resume formatting guide to help you decide. The additional skills section is a great way to conclude your resume with some applicable skills. Our applicant makes great use of the additional skills section by mentioning their proficiencies in Microsoft Office, Oracle, and AccuPOS. Make a special note of AccuPOS. Cash registers these days are becoming progressively more hi-tech, so knowledge of the POS software is highly desired. An easy way to impress a hiring manager and showoff your knowledge is to mention the POS software that you have used in the past. Using adjectives is one of the best ways to make your achievements and key skills stand out even more to the hiring manager. Just make sure you check out our detailed resume adjectives guide and list for details on how to properly use them to enhance your resume. If have questions regarding a professional cashier resume sample please leave a comment below. Need your cashier resume in a hurry? Our free resume builder will help you write one in minutes.